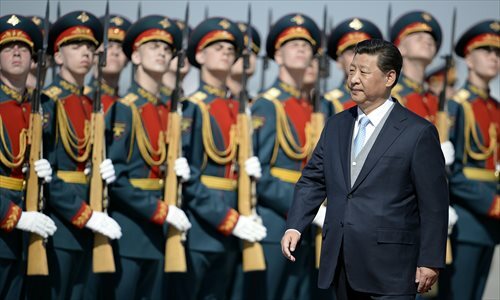 Chinese President Xi Jinping Friday arrived in Moscow and started talks with his counterpart Vladimir Putin, one day ahead of a World War II victory parade. It is the first meeting between the two leaders in 2015 and the eighth meeting since Xi became president, highlighting the distinctiveness of Sino- Russian relations. The two leaders are expected to discuss bilateral ties and international issues and are expected to sign a host of deals on energy, finance and investment. Some two dozen world leaders also headed to Russia Friday for the Victory Day parade that marks 70 years since victory over Nazi Germany. Xi will join them for the parade on Red Square and lay wreath to the Tomb of the Unknown Soldier on Saturday. Chinese authorities said that Xi's arrival not only showed China's strong support for safeguarding world peace after WWII but also signified that the all-round China-Russia strategic partnership of cooperation has made significant progress. In its final rehearsal on Thursday, over 16,000 service personnel from 11 countries marched through Red Square. Other than Russian troops, 732 personnel from 10 countries including China, India and Serbia took part in the parade rehearsal. In previous talks between Xi and Putin, the two sides have agreed to jointly commemorate the 70th anniversary of WWII. China's celebrations will be held in Beijing in September and Putin has confirmed to attend. It is the first overseas mission for a PLA Honor Guard since they got their new uniforms, and also the biggest of their five overseas missions, Han Jie, deputy captain of the guard, told the Global Times. In Friday's talk, Putin and Xi agreed that they are against attempts to rehabilitate Nazism or militarism, as well as historical falsifications, Russian news agency Sputnik reported. Xi's presence at the parade has further confirmed and promoted the historical contribution of China and Russia in the success of the anti-fascist war as the two main battlegrounds in the war, said Ruan Zongze, deputy head of the China Institute of International Studies in Beijing. The parade however has been snubbed by Western leaders due to tensions with Russia over the Ukraine crisis. Kiev meanwhile is also planning a "March of Peace" by Ukrainian and European army bands, saying that the commemorations, unlike those in Russia, are intended not to show aggression but to remember those who died. Wang Haiyun, former military attaché at the Chinese embassy in Moscow, told the Global Times that those countries which criticized or refused to join the parade are mixing up WWII commemorations with their own unpleasant diplomatic relationships with Russia. German Chancellor Angela Merkel is set to visit Moscow on May 10, a day after the Red Square victory parade to lay a wreath at the Tomb of the Unknown Soldier and hold talks with Putin. French Foreign Minister Laurent Fabius said he would go to Russia for Saturday's celebrations but won't be at the parade. "It's very irrational," Wang said. However he said Merkel's postponing her visit after the parade still showed Germany holds a correct attitude toward history but the decision was very likely made under pressure from Washington. Xi's presence also shown that the Sino-Russia relationship is mature enough that it won't be affected by other countries, Ruan said. Xi is scheduled to stay in Russia till Sunday. Putin and Xi announced on Friday that Eurasian Economic Union (EEU) and the Silk Road projects will be united. "The coupling of the EEU with the Silk Road is essentially the way to a joint economic space on the continent," Putin said. The two also signed a deal for Russia's Sberbank to open a 6 billion yuan ($966.43 million) credit line with China Development Bank. Russian Transport Minister Maxim Sokolov said Friday that China and Russia would invest 1 trillion roubles ($19.7 billion) in a Moscow-Kazan rail link and that it would be completed by 2020. The two countries will also cooperate to develop and produce new heavy helicopter, called the Advanced Heavy Lift, as TASS reported. The capital has been readied to embrace the victory commemoration, with posters of the 70th anniversary hanging everywhere from shops to subway stations. Young volunteers are distributing the St. George Ribbon, a symbol of victory in Russia, on the street. In the meantime, celebration events are being held with European leaders gathering in the Polish port of Gdansk for a midnight ceremony at the site where the first shots of the European war were fired. There will also be ceremonies in Paris, London, Berlin, as well as Washington.